You agree not to copy, modify, rent, lease, loan, sell, assign, distribute, reverse engineer, grant a security interest in or otherwise transfer any right to the technology or software underlying our sites or the Services. You agree not to modify the software underlying our sites in any manner or form, or to use modified versions of such software, including for the purpose of obtaining unauthorized access to our sites. Engage in any other illegal activities. Our site includes a combination of content that we create, that our partners create and that our Members’ create. All materials published on our sites, including, but not limited to, written content, photographs, graphics, images, illustrations, marks, logos, sound or video clips and flash animation, are protected by our copyrights or trademarks or those of our partners. You may not modify, publish, transmit, participate in the transfer or sale of, reproduce, create derivative works of, distribute, publicly perform, publicly display or in any way exploit any of the materials or content or our sites in whole or in part. If you would like to request permission to use any of the content on our sites contact us. We do not guarantee the accuracy, integrity or quality of the content on our sites. Our directory contains information about products and services offered by third parties, including product descriptions, pricing, availability, and location. We are not responsible for postings by suppliers, users in the user opinion, and message board or feedback sections of our sites. The information and materials posted on this Site may contain errors, omissions, or typographical errors or may be out of date. ChemFreeCom.com Directory may change, delete, or update any posted information or materials at any time and without prior notice. The information and materials posted on this Site are provided for informational purposes only and are not binding on ChemFreeCom.com Directory in any way except to the extent they are specifically indicated to be so. By participating in this site, you understand and agree not to post or transmit any material that, in our judgment, is defamatory, abusive, obscene, threatening or unlawful in any way, or any material that infringes on the rights of others or contains any virus or other computer programming routine which may interfere with or damage the site or otherwise interrupt on the ability of others to use or enjoy the same. We reserve the right to delete, move or edit any postings that come to our attention that we consider unacceptable or inappropriate, whether for legal or for any other reason. Furthermore, we reserve the right to deny access to anyone who we believe, in our sole discretion, has in any way breached these Terms or where we reasonably believe a user does not comply with any relevant age restrictions on the site. You agree to use our news groups, forums, communities and/or message or communication facilities (collectively, the “Forums”), only to send and receive messages and material that are proper and related to that particular Forum. If you choose a username that, in our sole discretion, is obscene, indecent, and abusive or which might otherwise subject us to public disparagement or scorn, we reserve the right, without prior notice to you, to automatically change your username, delete your posts from our sites, deny you access to our sites, or any combination of these options. Unauthorized access to our sites is a breach of these Terms and a violation of the law. You agree not to access our sites by any means other than through the interface that is provided by ChemFreeCom.com Directory for use in accessing our sites. Use of our sites is subject to existing laws and legal process. Nothing contained in these Terms shall limit our right to comply with governmental, court and law enforcement requests or requirements relating to your use of our sites. ChemFreeCom.com Directory makes no warranties or representations whatsoever concerning this Site or any linked site or its content, including the availability of any site or the information and materials on it or the accuracy, completeness, or timeliness of that information and materials. ChemFreeCom.com Directory also does not warrant or represent that your access to or use of any site will be uninterrupted or free of errors or omissions, that defects will be corrected, or that the site is free of computer viruses or other harmful components. Without limiting the foregoing, everything on this site is provided to you “as is” without warranty of any kind, either expressed or implied, including but not limited to the implied warranties of merchantability, fitness for a particular purpose, title, or non-infringement. Under no circumstances will chemfreecom.com directory be liable to you or any other person for any direct, indirect, consequential, incidental, special, or punitive damages, whether in contract or in tort, including negligence, arising in any way out of access to or use of or inability to access or use the site or any linked site or its contents, including but not limited to lost profits, business interruption, or loss of programs or other data on computer systems or otherwise, even if chemfreecom.com is expressly advised of the possibility of such damages. Unless otherwise noted, the trademarks, logos, and service marks used on the Site are owned by ChemFreeCom.com Directory or by third parties that have licensed their use to ChemFreeCom.com Directory. You may view and download these marks for informational purposes only as permitted by applicable copyright laws and must retain intact all copyright and other proprietary notices. Other use of these marks, except as specifically permitted in these Terms or the Site content or a writing signed by ChemFreeCom.com Directory, is strictly prohibited. No waiver by ChemFreeCom.com Directory of any breach or default hereunder shall be deemed to be a waiver of any preceding or subsequent breach or default. If any provision of these Terms shall be unlawful, void, or for any reason unenforceable, then that provision shall be deemed severable from the Terms and shall not affect the validity and enforceability of any other provisions of the Terms. Failure of the ChemFreeCom to insist upon strict performance of any of the terms, conditions and covenants hereof shall not be deemed a relinquishment or waiver of any rights or remedy that the we may have, nor shall it be construed as a waiver of any subsequent breach of the terms, conditions or covenants hereof, which terms, conditions and covenants shall continue to be in full force and effect. In the event that any provision of these Terms of Usage is found invalid or unenforceable pursuant to any judicial decree or decision, such provision shall be deemed to apply only to the maximum extent permitted by law, and the remainder of these Terms and Conditions shall remain valid and enforceable according to its terms. ChemFreeCom.com Directory shall not be liable for any non-performance or delay in performance caused by any act beyond its reasonable control, including but not limited to acts or omissions of third parties, unavailability of supplies, equipment failure, war, strikes, lock-outs, fire, flood, or any other Act of God, any law, regulation, ordinance, or other act or order of any court, government, or governmental agency, or delays, unavailability, errors, or other failures of the Internet or other data networks. We understand that the privacy of your personal details, and the security of your transactions with us, is of paramount importance to you. At ChemFreeCom.com Directory, we are committed to protecting your privacy. We will keep all the information you share with us confidential. We use your personal information only to process requests for information; we do not share your information with any third parties. We may make alterations or additions to this policy from time to time. Should we do so, we will update the policy on our web site. Information we require to supply our services. When you first sign up or contract with ChemFreeCom.com for our services, or when you make an inquiry about our services, we collect various pieces of information. This includes information such as your name, address, telephone number, domain name, email details of your primary and secondary contacts, as well as the answers to the questions that we ask as part of the application process. We may also collect other identifying details such as your age and gender. In order to verify your identity, we may ask you to provide questions and answers to security questions. If so, the above information will be stored in a secure location and we do not share any of your information with third parties. In this case we collect your name, email address and your message to us. We only use this information to respond directly to your request. Your information will not be shared with third parties. In this case we collect your name, your email address, your friends email address and your message to your friend. This information is processed by our Web server to provide you with a simple way of recommending a link to a friend. We do not store any of the information you submit from the form and it is not shared with third parties. If you respond voluntarily to our surveys or other interactive communications, we collect the responses and use the information to improve the quality and range of ChemFreeCom’s products and services. Once used for this purpose, any personal information captured is deleted. comply with our reporting and other obligations to third party suppliers and licensors, including Government agencies. in extreme circumstances, to protect the personal safety of users of ChemFreeCom’s services, its web site, our staff or the public. You might provide personal information through your participation in chat sessions, email exchanges or newsgroups accessed via our web sites, or another service provided by ChemFreeCom. This information is public and immediately available to anyone who has access to such a site; it is not private. ChemFreeCom urges you to only enter information that you are comfortable to share with the public at large in this public domain. ‘Cookies’ are small pieces of information that may be received and stored via your browser to your computer’s hard drive. ChemFreeCom operates statistics gathering software on its web site to collect information about the number of visitors coming to the site. No identifying information is collected by this software. The software records the IP address of the visitor only. We use this information to improve our own technical structure and performance, and to determine which areas of our web site are most popular. We use your IP address to help diagnose problems with our server, to administer and tune the operation of our site, and to log your browser type and referring URL information. Access logs show us which pages an IP address accesses on the visit. Error logs show any errors your browser encountered during a visit. Agent logs show us what type of browser you used to view the site. Data logs show us the keywords used to find our site and which search engine or point of entry you used. ChemFreeCom does not knowingly collect, use or market any information to children without seeking parental or a guardian’s consent. We also urge you to familiarise yourself with your legal responsibilities with regard to children and the Internet. If you have a complaint about any aspect of our Privacy procedures, please contact us on info@chemfreecom.com. We will deal promptly with your complaint. If the complaint cannot be resolved within a reasonable time to your satisfaction, it may be referred to the Privacy Commissioner. These are the standard terms and conditions of supply of services by ChemFreeCom. It is a condition of your use of any services that you comply with these terms and conditions. 1.2 You acknowledge that ChemFreeCom outsources to Providers for the provision of hardware, software, networking, storage and related tools to run the Services. 1.3 You agree that ChemFreeCom or its Providers will deliver the Services to you on the terms and conditions contained in the Agreement and that you will abide by the Agreement and promptly respond to any requests from ChemFreeCom for information required to provide the Services. 1.4 The Agreement commences on the date that you register to join as a Supplier of ChemFreeCom. 1.5 We may vary these terms and conditions, the amount we charge for the Services or the terms of the operation of the Services at any time by publication of a general notice on our website at http://www.ChemFreeCom.com. Variations other than price changes will become effective upon publication of the notice. Variations in the prices we charge for Services will come into effect on the date specified in the notice; which, unless otherwise specified, will be the next monthly payment cycle. 1.6 Use of the Services after publication of any variation in accordance with clause 1.5 will constitute acceptance by you of the varied terms. 1.7 The Agreement constitutes the arrangement in its entirety between ChemFreeCom and you and supersedes any prior agreements. 2.1 ChemFreeCom will use commercially reasonable endeavours to publish your complete listing/s on the directory within 2 business day of being provided with all necessary information as prescribed in the ChemFreeCom registration process and submitted by you to ChemFreeCom. 2.2 You will provide ChemFreeCom with such information as ChemFreeCom, or its Providers, reasonably require from time to time in order to provide the Services to you. This includes a current telephone number, email address and postal address. 2.3 You may change the level of Package and content of listings at any time in accordance within the procedures specified on our website. 2.4 You agree that ChemFreeCom or its Providers may from time to time add, remove or vary software associated with the Services or add, remove or vary functionality with respect to the Services. In addition you specifically consent to any Services change that may be undertaken from time to time. ChemFreeCom will use reasonable endeavours to provide you with at least 30 days notice of any Services change. 2.5 You acknowledge that ChemFreeCom has control only over the payment gateway or ecommerce platforms utilised on ChemFreeCom and for the purpose of ChemFreeCom transactions. 2.7 You acknowledge that ChemFreeCom has no control over any payment gateway or ecommerce provider which you may link to your website and any transactions undertaken or attempted to be undertaken with such provider are undertaken solely at your own risk. 2.8 ChemFreeCom commits to be bound by the relevant terms and conditions, service terms, guidelines and policies of the relevant Social Media Provider chosen by ChemFreeCom for use and reference on www.chemfreecom.com. 2.9.3 ChemFreeCom is not responsible for any modifications to any Social Media API by the Social Media Provider which result in any loss of functionality on your website and you agree that any such matter is an issue between you and the Social Media Provider. 3.1 ChemFreeCom or our Provider may be required to perform scheduled maintenance to servers from time to time. Where we are aware in advance that scheduled maintenance is likely to require the Services to be offline for more than three hours we will post details of the scheduled maintenance at least 48 hours before the scheduled maintenance commences. 3.2 ChemFreeCom or our Provider may also need to perform unscheduled maintenance from time to time. Where this results in the Services being offline for more than three hours, where known, we will post details explaining the event on our website after Services have been restored. 3.3 In the course of providing or administering the Services, ChemFreeCom or its Provider may be required to save, file, upload or otherwise manipulate your Content. Neither ChemFreeCom or its Provider will, under any circumstances, including negligence, be responsible for any loss of, misfiling of or failure to upload any of your Content and you will provide further copies of your Content promptly upon request by ChemFreeCom should any loss, misfiling or failure to upload occur. 3.4 ChemFreeCom or its Provider will, but has no obligation to, archive your content onto back up mechanisms from to time to time for the purpose of disaster recovery. In the event of equipment failure or data corruption we or our Provider will restore Content from the last known good archive if one is available. 3.5 You acknowledge that you do not obtain any rights to or interest in the software, hardware and other infrastructure and facilities used by ChemFreeCom or its Provider to deliver the Services as a consequence of entering into this Agreement. ChemFreeCom claims no intellectual property in respect of your Content. You grant to ChemFreeCom and its Provider a non-exclusive world-wide royalty free licence to use, save, transmit, display, adapt and reproduce your Content in order to provide you with the Services. 5.1 You must pay for the Package in accordance with the prices published by ChemFreeCom on our website, as amended from time to time in accordance with the Agreement, and in accordance with any quote accepted by you for Services outside your standard plan inclusions. 5.2 Prices published on the ChemFreeCom website are in Australian dollars and are exclusive of any Australian government taxes or charges unless specified otherwise. Such Australian government taxes or charges will be charged in addition. An example of this is the Goods and Services Tax (GST). 5.3 Package fees are payable monthly in advance by any of the payment options specified on our website. You must pay all amounts billed in accordance with your Package option and the Agreement. No credit terms are given. If you elect a credit card payment option you authorise us to debit your credit card for all amounts payable under the Agreement. 5.4 The ongoing billing period is on a monthly cycle beginning 30 days after the Registration Date. The Package will commence on the Registration Date and continues on a monthly basis without notice to you, until the Agreement is terminated in accordance with these terms and conditions. 5.5 Any changes to your Package will take effect on the next monthly payment cycle. This includes both increases and decreases in subscription fees. 5.6 Fees for ad hoc Services are payable in advance or in accordance with the payments terms specified in the quotation provided to you in respect of those Services. 5.7 In the event of a charge back by a credit card provider (or similar action by any other payment provider) ChemFreeCom may suspend the Services or terminate the Agreement immediately. 6.2.5 inaccurately describe or failure to correct your supplier profile on ChemFreeCom. 7.1.6 you will at all times use the Services in accordance with this Agreement. 8.1 To the extent permitted by law, neither ChemFreeCom nor its Associated Parties make any warranties or provide any guarantees of any kind, whether expressed or implied, statutory or otherwise relating in any way to the subject matter of this Agreement. 8.2.5 as to the accuracy, reliability, completeness or content of the Services, any information services or merchandise contained in or provided through or ancillary to the Services. 8.3 You acknowledge and agree that neither ChemFreeCom or its Associated Parties exercises any control over, and accepts no responsibility for, the content of the information (including your Content) passing through ChemFreeCom’s or the Providers’ host computer, network hubs and points of presence on the internet, nor for any of your products and services. 9.1.6 any action taken by ChemFreeCom or its Provider in connection with you undertaking or attempting to undertake any of the activities listed in clause 6.2. 10.1 You agree that neither ChemFreeCom its officers, directors, partners, employees or agents nor its Provider shall be liable for any indirect, incidental, special punitive, exemplary or consequential damages of any kind, or loss of profits, revenue, data or use, suffered by you or any third party, whether in an action in contract, tort, under statute, strict liability or other legal principle even if ChemFreeCom or its Provider, as the case may be, has been advised of the possibility of such damages. 10.2 Subject to clause 10.1, you further agree that the aggregate liability of ChemFreeCom and its Provider for any damages, losses and cause of actions whatsoever, (including negligence) shall not exceed the actual dollar amount paid by you for the Services which gave rise to the damages, losses or cause of action. 10.3 You agree that where any statute implies or incorporates any term or guarantee into this Agreement, and that statute avoids or prohibits provisions in a contract excluding, restricting or modifying the application of or liability under such a term or guarantee, then the term or guarantee will be taken to be included in this Agreement. However, the liability of ChemFreeCom and its Provider for any breach of the term or failure to comply with the guarantee will, if permitted by that statute, be limited at our option to the re-supply of the Services again or the payment of the cost of having the Services supplied again. 11.1 You acknowledge that all right, title and interest in any and all of Our Intellectual Property is vested in ChemFreeCom, its Provider and their respective licensors, as applicable, and unless specifically provided in this Agreement, you shall have no right, title, claims or interest in Our Intellectual Property. 11.2 You may not copy, modify or translate any of Our Intellectual Property or related documentation, or decompile, disassemble or reverse engineer any of Our Intellectual Property to use it other than in connection with the Services nor may you grant any other person or entity any right to do so. 11.3 Unless otherwise specifically permitted by this Agreement, you must not distribute or authorise others to distribute any of Our Intellectual Property provided however, that nothing in this clause shall preclude you from using Our Intellectual Property as incorporated in the Services. This clause 11.3 shall not operate to extinguish, restrict, vary, waive or affect in any manner any right, title or interest which you may now have or hereafter acquire in, or in relation to, the third-party software that is part of or provided with the Services solely to the extent such third-party licensors publicly provide such right, title or interest in the third-party software to you. Neither ChemFreeCom nor its Provider shall be liable for failure or delay in performing its obligations under this Agreement if such failure or delay is due to circumstances beyond its reasonable control, including acts of any governmental body, war, insurrection, sabotage, embargo, fire, flood, strike or other labour disturbance, interruption or delay in transportation, unavailability of or interruption or delay in telecommunications or third party services, failure of third party software or inability to obtain raw materials, supplies, or power used in or equipment needed for provision of the Services. 13.1.2 during any technical failure, modification or maintenance of the Services provided that we will use reasonable endeavours to procure the resumption of the Services as soon as reasonably practicable. 13.2 Notwithstanding any suspension of the Services under clause 13.1, you shall remain liable for all charges payable in respect of the suspension period. 13.3.3 an outside party or outside device disrupting or attempting to disrupt the Services. 13.4.2 at any time on at least 30 days written notice to you. 13.5 ChemFreeCom may terminate or replace its Provider at any time without notice to you. In such event ChemFreeCom will endeavour to ensure minimal disruption to the Services and a continuation of substantially the same terms as set out in this Agreement. 13.6 Where ChemFreeCom is unable to comply with clause 13.6 you may terminate this Agreement within 30 days of being notified of the new terms on which ChemFreeCom intends to supply the Services to you. In such event you will be entitled to a refund on a pro rata basis of fees paid in advance but shall remain liable for all charges up to the date of termination. 13.7 You may terminate this Agreement at any time by giving ChemFreeCom written notice of intended termination at least 14 days before the date upon which fees under your Package are next due. Notice to ChemFreeCom must be sent to info@chemfreecom.com. ChemFreeCom will upon receipt of such notice promptly confirm by email to you that the termination notice has been received. Your notice of termination is not effective unless confirmation of receipt by ChemFreeCom has been received by you. Where notice has been received and confirmed pursuant to this clause the Agreement shall terminate on the day before Service Plan fees are next due. If notice of termination is not given at least 14 days before the date specified in the previous paragraph you shall remain liable for one further month of the fees payable under your Package and the Agreement shall terminate at the end of that further month. 13.8.5 except in the case of termination of the Agreement by ChemFreeCom for breach by you, you will be entitled to a refund of any monies prepaid for any period after the termination date. 14.1 The law in force in Queensland, Australia governs this Agreement. 14.2 In the event that ChemFreeCom enforces its rights under this Agreement you agree to pay all fees incurred by ChemFreeCom, including but not limited to legal fees and collection agency fees. 14.3 This Agreement shall be binding upon and inure to the benefit of you, your respective successors and assigns. You may not resell any Services or assign your rights and obligations under this Agreement without ChemFreeCom’s prior written consent. 14.4 ChemFreeCom may assign its rights and obligations under this Agreement as it sees fit. 14.5 A provision of, or a right or obligation created under this Agreement may only be waived in writing signed by the party granting the waiver or varied in writing signed by both parties. 14.6 In any provision of this Agreement is held by a court of competent jurisdiction to be invalid, unenforceable or void, the remainder of the Agreement shall remain in full force and effect provided that the efficacy of its contractual intention remains. CHEMFREECOM (Chemical Free Community) provides to its members a special logo, or community “member seal” in various forms (digital & physical), which is intended to allow members of non toxic – less toxic, chemical free and organic businesses, users and the general public – to know that a particular company, or division of a company, is a member of the Chemical Free Community. The members seal is not a certification in any way. Users and general public must always be directed to view a member’s chemical status on their Chemical Free Community listing. The logo is intended to be displayed only by current members of the community in standard marketing materials. A typical use of such “seal” could include a website, a printed brochure, banners and advertisement. If a company is interested in using the members seal on product packaging please contact info@chemfreecom.com. 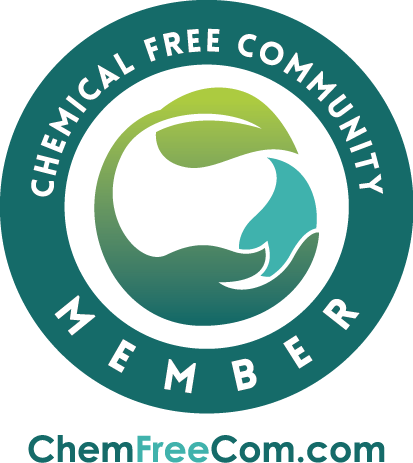 The CHEMFREECOM “member seal” is available to all active members who have read and accepted the CHEMFREECOM Terms and Conditions. CHEMFREECOM may choose to cancel the membership of any member company before the end of a standard term (one calendar year) and, as such, any cancelled member must remove the “member seals” from the member’s website and/or any printed brochures or advertisements which have not been distributed. CHEMFREECOM reserves the right to refuse the member seal to any company, at its sole discretion. CHEMFREECOM reserves the right to request that a company with a displayed “member seal” remove said seal from web or print distribution, at its sole discretion. Companies who do not renew membership with the CHEMFREECOM, or whose membership is terminated by CHEMFREECOM, must remove the displayed seal from any web or marketing materials within 5 business days. Purchase the CHEMFREECOM Member Seal that best suits your needs from the CHEMFREECOM member Dashboard. Email info@chemfreecom to register the number of platforms and items upon which the seal will be used. Contact CHEMFREECOM to collaborate and agree on a social media strategy to best support the promotion of members seal on company www and printed collateral. MEMBER SEAL FOR PRODUCT PACKAGING. Email info@chemfreecom to obtain approval and discuss requirements. Discuss and agree on a social media strategy for CHEMFREECOM to support the promotion of members seal on company product. “Agreement” means these terms and conditions and any policies, templates, forms, processes, pricing or Service Plans referred to in these terms and conditions as in effect from time to time. “Associated Parties” means any Provider, employee, officer, affiliate, agent, supplier, third-party information provider, merchant, licensor or the like in any way associated with the provision of the Services. “ChemFreeCom”, “we”, “us” means Zoodle Enterprises Pty Ltd trading as ChemFreeCom ABN 75159507301 in the State of Queensland, Australia. “Content” means any data, website content or files provided by you or third parties, in any form, in connection with your listing on ChemFreeCom or its Provider’s servers. “Order Form” means the form or template, accessible from our website, to be completed by you providing information to ChemFreeCom in order for us to provide the Services and requesting that we do so. “Our Intellectual Property” means all right, title and interest in any and all technology, including the software, documentation and material that is part of or provided with the Services and any know-how, trademarks or service marks of ChemFreeCom, its Provider or the licensors of ChemFreeCom or its Provider (as applicable). “Megabyte Limit” means the data transfer bandwidth limit or disk space limit referred to in clause 2.3 – ChemFreeCom Terms & Conditions. “Package” means the subscription level for ChemFreeCom Service as outlined on the Pricing page on the www.chemfreecom.com. “Provider” means any third party supplier of ChemFreeCom who provides any goods or services contemplated by these terms and conditions whether supplied directly to the customer or via ChemFreeCom. “Services” mean the ChemFreeCom website design, hosting and related services offered from time to time on the ChemFreeCom website at http://www.ChemFreeCom.com. “Social Media” means any online technology allowing for communication through social interaction via the internet. “Social Media Provider” means any provider of Social Media and includes Facebook, Twitter, Flickr and YouTube. “Social Media API” means any application programming interface provided by a Social Media Provider. “Supplier” means the person or entity who has registered on ChemFreeCom as a supplier of products and services. “User” means the person or entity who has registered to utilise the functionality of ChemFreeCom. “You” means the person or entity to whom the ChemFreeCom Services are supplied.